PM: Fiscal Cliff plunge = rally? What was the least expected price action today? That is exactly what we got. Markets don’t move on fundamentals or technicals, they move on supply and demand. Run out of sellers and markets rally, cliff or no cliff. Stocks were up 1.7% on the final day of the year. The market opened lower, but rallied through the day on Fiscal Cliff hopes. This put the hurt on bears as the obvious Fiscal Cliff collapse turned into a monster rally instead. A lot of traders were positioned for a Fiscal Cliff collapse and this rally caught them by surprise. People pay too much attention to the news and not enough to how other traders are positioned. Deal or no-deal, the Fiscal Cliff is a drag on the economy, but if you trade the fundamental story, you would be on the wrong side of this trade. This is because markets respond to supply and demand, not fundamentals or technicals. Everyone saw the Fiscal Cliff coming from a mile away and sold ahead of it. There is no supply of new sellers remaining, thus we rallied in spite of the headlines. Speaking of headlines, lawmakers have a couple more hours to strike a deal and avert the cliff, but this focusing on the wrong thing. We are obsessing over “deal or no-deal”, but this isn’t a binary event. A deal doesn’t save us and no-deal doesn’t ruin us, but that is the way people are trading it. Once we are past the deal/no-deal hoopla, the market will move its attention to something else. Maybe that is the ramifications of the compromise, maybe it is Europe, or maybe something entirely new. Remember every ECB meeting or employment report from last year that was supposed to “make or break the market”? The Fiscal Cliff will be just like that, hours later and it will be ancient history. Most of the selling already happened and the high probability trade is to the upside. All the sellers have sold and supply is drying up. Within hours of the New Year and we still don’t have a deal. When markets open on Wednesday, that could pressure prices, especially since we had a strong short squeeze Monday. But even renewed weakness presents a buying opportunity because the market is so overly pessimistic and most of the weak hands have already sold. The strength of the indexes was only out-shined by the monster run AAPL had, up nearly 4.5%. This stock is finding buyers and running out of sellers, a recipe for higher prices. It won’t be a smooth ride because there is a lot of overhead supply to work through, but the stock has probably seen the lowest of the lows. I’m not an AAPL bull by any stretch and think they will see real competition from Samsung and Microsoft next year, but the stock was oversold and presents a great buying opportunity as we will probably see $650 this year, maybe even before summer. Churning sideways at 1410, but the asymmetric trade remains to the upside as most traders fearing the Fiscal Cliff already sold and holders are willing to hold in the face of this risk. Markets are down a half-percent in light trade as everyone awaits developments out of Washington. We bounced off 1400 yesterday and are holding around 1410 today. So far 1400 is the line in the sand, break below this and we could see a wave of technical and stop-loss selling hit the markets, but so far bulls have successfully defended this key level. The Fiscal Cliff continues dominating headlines at the expense of everything else. Yesterday’s bounce off 1400 started when the House announced it was reconvening on the 30th. While there is little hope a deal will be reached over the next few days, this development was enough to squeeze bears out of the market. This hints at the upside potential if good news comes out. On the other side, most traders are already resigned to falling off the cliff. Those afraid of headlines already sold ahead of the 31st expiration, leaving few sellers still in the market to actually sell the news. If anyone was convinced we were headed over the cliff and this would lead to a massive selloff, who wouldn’t sell ahead of it? These pessimistic expectations and positioning create an asymmetrical trade to the upside since most of the downside has already been realized. This isn’t to say we cannot see further near-term weakness. While we won’t see a massive wave of selling, a dearth of buying can also pressure prices, but the upside potential at this juncture is greater than the downside. Success n the markets it isn’t about predicting the future, but knowing the probabilities of various outcomes and trading those when they are in your favor. Most of the Fiscal Cliff selling has already happened, meaning we should only see modest weakness after the event, and might even see the market find support in a sell-the-rumor, buy-the-news phenomena. While dysfunction in Washington is not a good thing, once all the selling happens, supply dries up and the market has nowhere to go but higher. Since this is such a well telegraphed event, most of the Fiscal Cliff selling will happen ahead of time and the new crop of buyers are willing to hold through this volatility. The ironic thing about stock holders expecting volatility is they eliminate volatility. This is because confident holders don’t sell the headlines and that is all it takes to put a floor under the market. Since we are so close to 1400 and all the stop-losses resting just below this technical support level, even modest weakness could drop the market to the point where it sets off a wave of autopilot selling. But while the avalanche might feel scary, it will find a floor not long after because the autopilot selling will climax fairly quickly when it isn’t followed up by real selling. Many of the holders bought after the election and in the face of Fiscal Cliff headlines, meaning they have a longer-view of the market are harder to shakeout. Their confidence in the future prospects will keep a bigger wave of selling at bay. AAPL is holding near $510, giving traders another opportunity to jump in at the $500ish level. Funny how when the stock is $550 or $600 people wish they bought at $500, but when it retreats back to $500, it is hard to pull the trigger because it looks like it is breaking down. My experience is the hardest trades to make often work out and the easy trades blow up in my face. If a stock seems too high, it keeps going higher; if only fools would buy it, it probably bottomed. On the other side of the coin, if a rising stock is a sure thing, it is probably peaking and if a falling stock looks like a great buy, then it will probably continue lower. And this isn’t just hyperbole, there is a lot of psychology and supply and demand dynamics that make this a very real phenomena that we can get into at some other time. 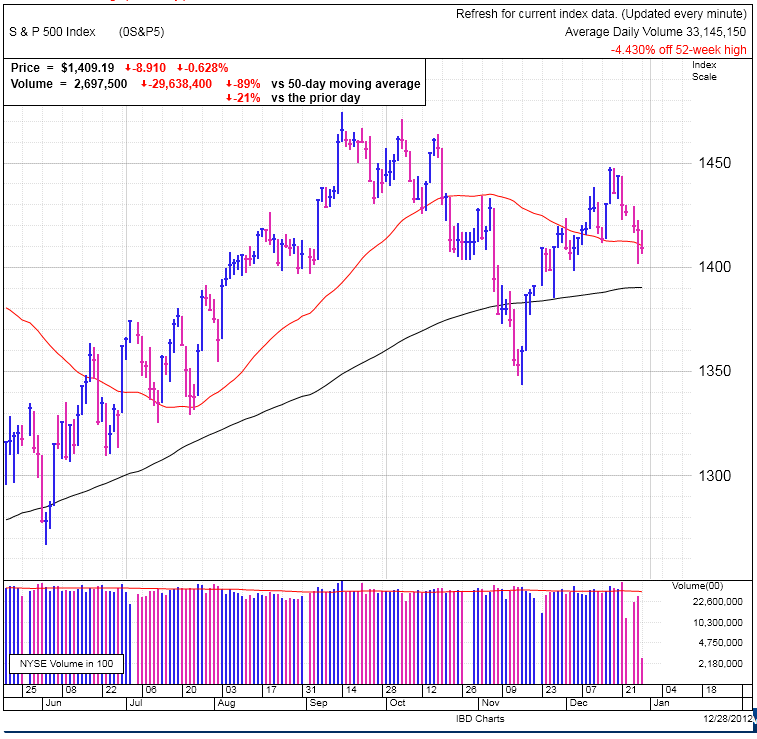 Stocks are down for the 4th day and finally breached the 50dma. Volume is light in the holiday shortened week, but volatility and uncertainty remain high because of the ongoing Fiscal Cliff debate in Washington. Not many big money managers are interested in buying stocks this holiday week. As we discussed last week, most senior decision makers are on vacation and the junior traders manning the desk don’t have the authority to make new buys and are just there to sell stock if we break key technical levels. Today we find ourselves at two of these key levels, the 50dma and 1400. Will stocks fall further as automatic sell orders are placed and value buyers are on vacation and not there to put a floor under the market? There are few optimists remaining who think a Fiscal Cliff deal will happen before the end of the year. Falling off the cliff is already baked in and we don’t need to fear a massive selloff when we officially go off the cliff next week. It is so widely expected, anyone who fears the cliff already sold, limiting the amount of new selling to hit the market when it actually happens. But while we won’t get hit with a wave of selling, lack of buying can also push prices lower and we could see further weakness until value buyers come back to work next week. Most of the Fiscal Cliff fears are already baked in the market, meaning there is more upside than downside at this point. Traders can wait for more weakness to develop, but don’t pile on the short-side expecting a plunge because most of the selloff has already happened. Instead start looking for the next big opportunity on the long-side as the market moves past Fiscal Cliff worries. Finding support at 1400 would signal a good time to buy stocks. Buy the rebound instead of trying to catch the falling knife. A dip under 1400 could trigger more selling before we finally bottom, so wait for the confirmation. While a lot of the professional Fiscal Cliff selling has already taken place, the wildcard is an emotional selloff from 401k investors. Will these less experienced investors hit the panic button when the January 1st headlines are screaming Fiscal Cliff collapse? There is a chance we could see a repeat of the cascading post-election selloff, but that seems less likely because November’s selloff shook out most weak and emotional hands, leaving us primarily with holders that are less skittish in the face of uncertainty, hence the reason they are holding in the face of the Fiscal Cliff worries. AAPL is making a move for the $500 level again on the back of broad market weakness. Recent support at $500 might encourage more adventurous value investors to jump in at these levels. As risky as it seems owning AAPL down here, this is the safest time to own AAPL in nearly a year. AAPL has gone from everyone’s favorite stock to the favorite whipping boy with countless reasons not to own it. The recent slide made it hard to remain positive on the stock, but this change in sentiment was inevitable given how bullish everyone has been for so long. Can the stock slide under $500? Absolutely, but buying AAPL at $500 is without a doubt safer than buying it at $700. Keep an eye out for a material penetration under $500, but 10% risk to the downside and 20% opportunity to the upside sets up for a nice trade. Stocks are down fractionally on Christmas Eve as most buyers and sellers are taking the day off. 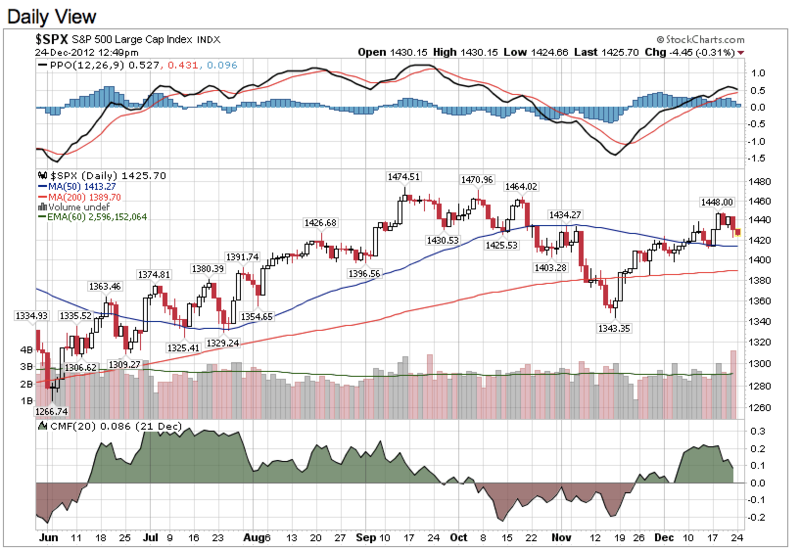 We are sitting at 1425, but we need to be wary of any dip under 1410 that would violate the recent bounce and 50dma. This would trigger a wave of stop-losses clustered below these technical levels, further pressuring the market. Friday’s selloff didn’t continue and overwhelm today’s light pre-holiday trade. While we might see more weakness in coming days, don’t expect a major collapse. All the bears who are pessimistic about this economic and political environment have leaned into this market with all their might and the best they coud manage was a 20 point decline. The market also tried to shake out weak holders and but failed to induce many traders to bail on their positions. Most of the holders in this market are willing to hold through the headline risk and that bodes well for the bull case. News doesn’t drive markets, people trading stock does. If bears are already out/short and holders are willing to hold through volatility, then markets defy gravity and negative headlines slide right off. This description fits our current situation pretty well. Going into next year how do things look? We have all this headline risk and pessimism already priced into the market. If we have already realized most of the downside, it doesn’t take a genius to figure out what the markets will do once we see a constructive resolution to these risks? Be ready to buy the rebound in the second half of this week. We could see some initial weakness, so wait to buy on strength. Shorts really need to get out-of-the-way of this market and should use weakness today or Wednesday morning to go flat. Most people now anticipate us moving into the new year without a Fiscal Cliff deal, so don’t expect major selling when that widely expect event comes and goes. AAPL is up modestly in spite of broad market weakness. The low $500 range attracts buyers as we bounced off this level three-times already. So far this has provided firm support for AAPL shares and is a key line in the sand going forward. AAPL is buyable as long as we hold above this line. Drop under $490 and we need to reevaluate. I would largely discount selling due to another analyst downgrade or other opinion based analysis. The only thing that would concern me is a material change in fundamental data out of the company in their upcoming earnings report. Markets were positive last week, but finished on a sour note after Friday’s selloff. The big question is if the market will continue the weekly trend higher, extend Friday’s slide, or the third option, a bit of both, further weakness before rebounding higher. The holiday-shortened week will see light volume as most big-money managers are on vacation. Obviously these guys cannot closeout their positions before leaving, so to manage risk their only alternative is leaving stop-losses to protect their portfolio. Some of these are electronic, others are junior traders stuck manning the desk through the holidays. But while the junior traders have the authority to sell shares if the market hits predetermined stop-loss triggers, these young traders don’t have the same authority to initiate new buys. What makes this noteworthy is it creates an imbalance with sell triggers piled around key technical levels but very upside catalysts where automatic buying will take place. The light volume also increases the opportunity for volatility because smaller orders carry more weight and can move the market. It could make for an interesting week with a slight negative bias. But often these holiday week moves are not fundamentally driven and do not stick once the decision makers return to work. The lack of massive selling last Friday on the Fiscal Cliff breakdown, shows the market is not spring-loaded to the downside. This is encouraging news for bulls looking to buy this market. We could see some carry over from Friday’s selloff, but barring panic induced selling, we are close to the bottom. As I shared above, the holiday week could result in a negative bias, meaning we might wait to buy until the back half of the week to see how things develop. We could easily see the market take off on light volume, but we could also see it plunge if stop-loss selling kicks in. But either way expect the market to stall after the initial flurry of orders is filled. I continue being constructive into next year as the market stops worrying about the Fiscal Cliff and a lot of this new money from special dividends and 2012 tax selling gets pumped back into equities. Even longer-term there is huge upside potential as money starts flowing out of bonds and back into equities. AAPL is the exception where I expect there are many automatic buy-orders near the $500 level with big money itching to get back in the stock near these lows. If there is weakness in the markets, we could see AAPL find a floor near $500 as junior traders are under orders from their bosses to buy any time AAPL dips to $500. For those holding the name, this could provide some downside protection. Of course breaking $490 and all bets are off and you’ll see a lot of stop-loss selling punish the stock. Some people criticize my analysis because I lay out two different scenarios. But the truth is I don’t have a crystal ball and I cannot know for certain what the market will do in the future. I trade the higher probability, but even low probability events happen on a regular biases I am always considering multiple outcomes so I am prepared for whatever the market throws at me and I know how to trade different situations. In AAPL’s case, I expect to find support at $500 and the stock is buyable here, but dip under $490 and expect a wave of stop-loss selling to punish the stock. How a person trades that cascade of selling depends on their timeframe and holding period. But having a plan at $490 helps alleviate some of the fear and doubt that inevitably happens when a trade moves against us. In spite of how the week ended, it was a positive week for the market and Friday’s selloff was fairly modest if that is what a Fiscal Cliff breakdown looks like. For all the drama on Friday, market still had a good week, finishing higher by 1.2%. We hit 1450 on Tuesday, fell to 1422 on Friday, and closed the week at 1430. Volume swelled in part due to options expiration. This week markets notched a higher-high, breaking above the early November pre-election high and snapped a trend of lower-highs and lower-lows dating back to September. 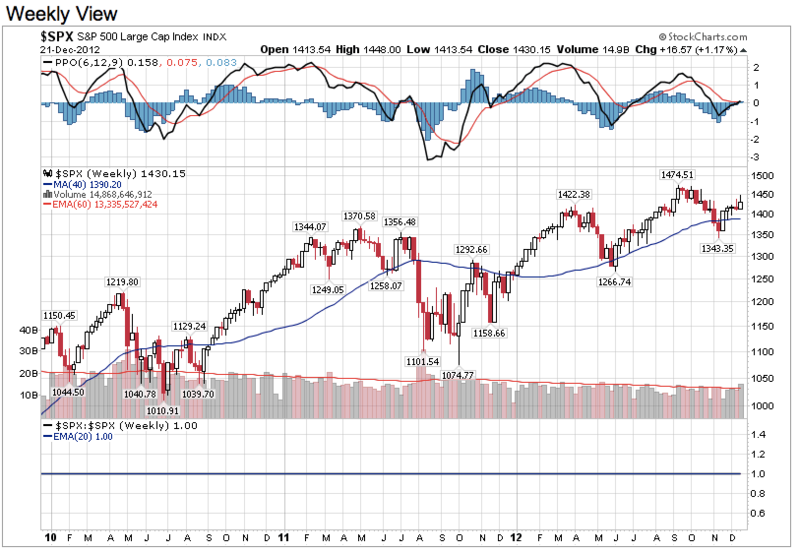 The weekly chart shows the uptrend is still intact in spite of all the pessimistic headlines flying around. Taking a step back and looking at weekly charts helps eliminate the daily noise and whipsaws that mislead so many traders. Markets remain skittish and everyone is wary of the next breakdown, but it just hasn’t come. The most we’ve seen is a 20-point selloff. No doubt the fear of a selloff is preventing the selloff. Many of the potential sellers are already out of the market and the current crop of owners are comfortable holding in these uncertain markets. This confidence and cool hand by current owners is preventing a wave of selling to flood the markets and pressure prices. Friday’s apparent collapse of Fiscal Cliff talks left many traders expecting us to cross into 2013 without a deal. For such a widely feared event, the market’s reaction was fairly constrained. This shows the market is not ready to plunge into the abyss and defeats a major pillar of the bear’s argument. Some of the worst news was realized and we didn’t see a wave of panicked selling consume the market. In this case, the elevated anxiety and lack of complacency was a buffer that prevented the very thing the market feared. This is just another example of how you can safely ignore what everyone is talking about. No doubt we could see further weakness in the light holiday week, but barring a collapse of the market, stocks look attractive here for both short-term and long-term investors. AAPL had a nice week, also finishing in the green by 1.9%. Weekly volume fell off, which is a good thing at this point because it shows a lot of the emotional trade is winding down. 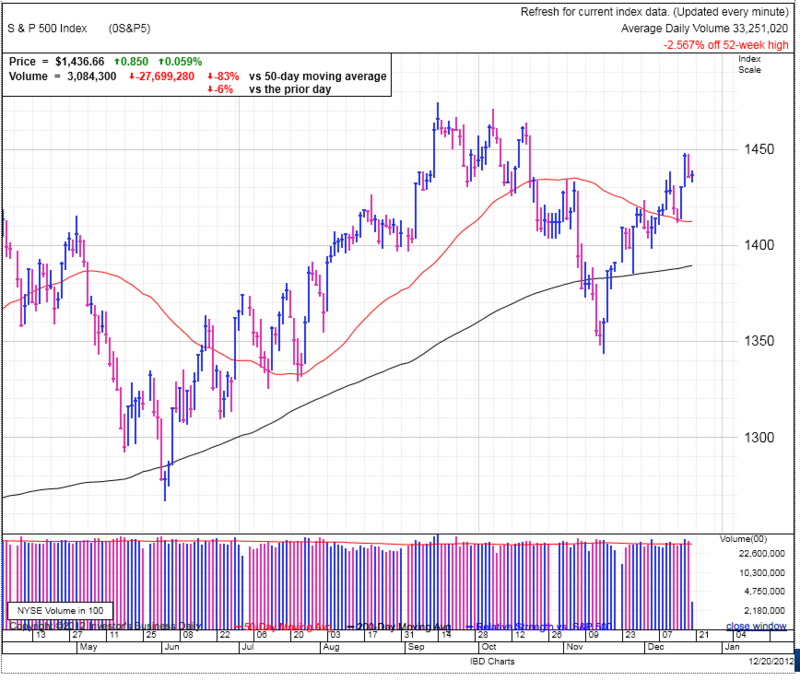 The stock might rally modestly into the January earnings report and that will be the next catalyst either up or down. Given the widely divergent views on the stock it is hard to imagine the stock not reacting to earnings as it proves one side right and the other side wrong. Stocks sold off after Fiscal Cliff negotiations bogged down. The encouraging sign is the market didn’t collapse after the initial hit and managed to close above the lows. Between the weekend and Tuesday’s holiday, there are fewer opportunity to trade changes in sentiment if the Fiscal Cliff situation evolves over the weekend. Volume was huge, almost 50% higher than average as a flurry of stock changed hands between the headlines and options expiration. Much of the trading was market makers unwinding positions and day traders and high-frequency traders taking advantage of the news driven volatility, but there was also some real trading as fair-weather holders transferred shares to braver value investors. If these new owners are more committed to holding, it should soak up supply and calm the markets. Traders had the opportunity to punish the market, but selling abated in the afternoon. We found support and bounced near 1422, ultimately returning to 1430. Obama left for Hawaii and most of Congress went home, so we probably won’t see new developments from the Fiscal Cliff until after Christams. Personally I think the market has been too obsessed with deal or no deal and little attention paid to what the deal might look like. Take Boehner’s offer and Obama’s offer, split the difference and see how that looks. If we are okay with that level of austerity, then the market is a buy here. If the market finds a bottom on the heels of a Fiscal Cliff meltdown, there is not much left to break this bull. Monday will be a throwaway day on extremely light volume. It will be hard to get a good reading from that price action and we will need to see a confirmation later in the week to validate either support or continued slide. I continue my bullish inclination and seeing the market hold up next week will confirm those views. If the market finds support it becomes a good buy into next year. The interesting thing to watch will be how the markets move in the time leading up to the Fiscal Cliff resolution. If the market rallies into a deal, then we might see a sell the news trade develop. If the market remains cynical and stays flat, we could see it rally on a deal. Either way our trading strategy evolves as the sentiment in the market changes. It is not about being a perma-bull or perma-bear, but trading the hand we are given. 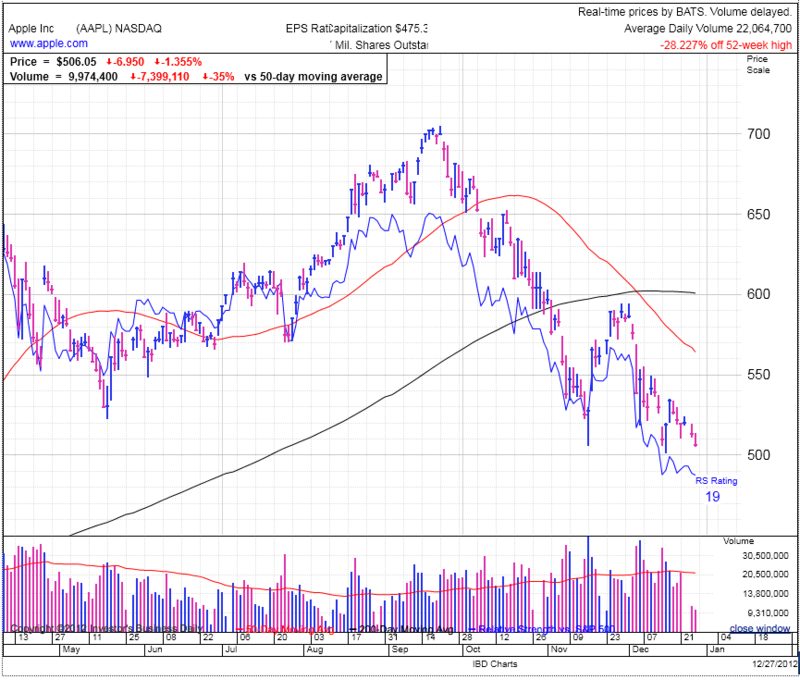 AAPL showed strong resilience in the face of the market’s headwind by finishing at the top of the day’s range. A lot of nervous holders were flushed out of the name in the selloff and the new crop of resolute owners brought stability back to the name. I’m not sure when or if the stock will break $700, but there is plenty of upside without making new highs. AAPL’s buy and hold days might be behind it and it will likely take rangebound strategies like swing trading or selling options to continue making money in the stock. Markets gapped lower at the open after Boehner’s Plan B crashed and burned. Overnight S&P500 futures dipped 1.7% but the market eventually opened down 1% this morning. The market attempted an early rebound, but that fizzled in the second hour and we are currently making new lows. Technically speaking the market is still in good shape. 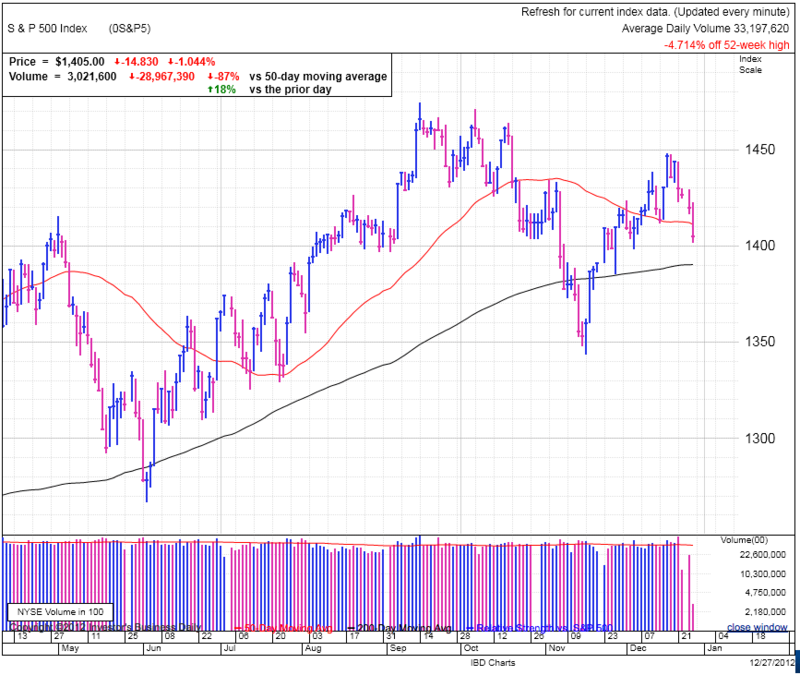 We are well above the 50dma and currently holding above support at 1420. While the headlines are scary, the market is not in a bad position yet. Of course the big risk comes from a potential wave of supply hitting the market if we break these key levels and trigger a lot of new selling. Right now the market is suffering a crisis of confidence. The recent rally priced in a fair amount of optimism over a timely resolution to the Fiscal Cliff, but yesterday’s developments put that in doubt. Many of the buyers who were sucked in by the “everything’s fine” aura put off by the market are fleeing in droves. The question is if this new selling will shake the confidence of previously steady holders. A lot of traders are apprehensively sitting at their desks with their finger on the sell button this morning. If further weakness develops and we start making new lows, these potential sellers will hit the market with a new wave of supply. I’m actually surprised at the market’s reaction to the failure of “Plan B” because Plan B was dead on arrival between the Democrat controlled Senate and Obama’s veto. Of course these fractures in the Republican party give Democrats the upper hand; united we stand, divided we fall. A lot rests on Boehner’s shoulders right now. He can put forward a more moderate plan that would win the endorsement of moderate Republicans and Democrats. Or Boehner could let ideology trump reason and stubbornly push an all or nothing agenda. Boehner will cave at some point, but politics is a game of showmanship and expect Boehner to put on an act for his constituents before letting a deal happen. There are three reasons the market will sell off, changing fundamentals, normal swings in supply and demand, and a wave of emotional selling. I’m assuming the Fiscal Cliff deal will get done eventually, so the fundamental picture doesn’t change much. We were poised for a normal pullback after the strong 100 rally in a month. These are modest corrections and don’t go too far or too fast. And there is emotional selling, the most unpredictable of the group. The on trait often seen with emotional selling is it often goes further and longer than anyone expects. The post-election selloff is a perfect example. The thing we have to watch for here is if this is just a normal rebalancing of supply and demand, or if it turns into an irrational and emotional selloff. We should know pretty quickly if this thing finds support or selling gets out of hand. Markets are lower, but the losses are not accelerating in the first couple hours of trade. We are standing on a trapdoor, but it hasn’t opened yet and it might not open depending on what other market participants think. If we hold these levels, anxious owners will start to relax and buyers will begin nibbling. But if the market cannot find a floor, selling will pick up as we break through levels of concentrated stop-losses at 1420 and the 50dma. How to trade this. Long-term holders should no watch the intraday market, it will just shake your confidence. Look back at the reasons you bought and make sure they are still valid. If so keep holding and mentally prepare yourself for potentially more downside before things rebound. Swing traders, watch for a buying opportunity, but don’t get in front of this selloff. Let things settle down before jumping in. This might be a modest correction or it could turn into an avalanche. In cases like this it is better to be a little late than a little early. Shorts should start looking for an exit to lock in profits. You can hold for a little longer, but don’t get greedy. The market and economy have not fundamentally changed, so don’t expect a major market crash. We will find a floor over the next few trading days and if you don’t lock in profits, you risk giving them all back. And for those considering putting on a short today, you are risking have this market snap back in your face. It is best to get in ahead of these things because chasers almost always end up holding the bag. 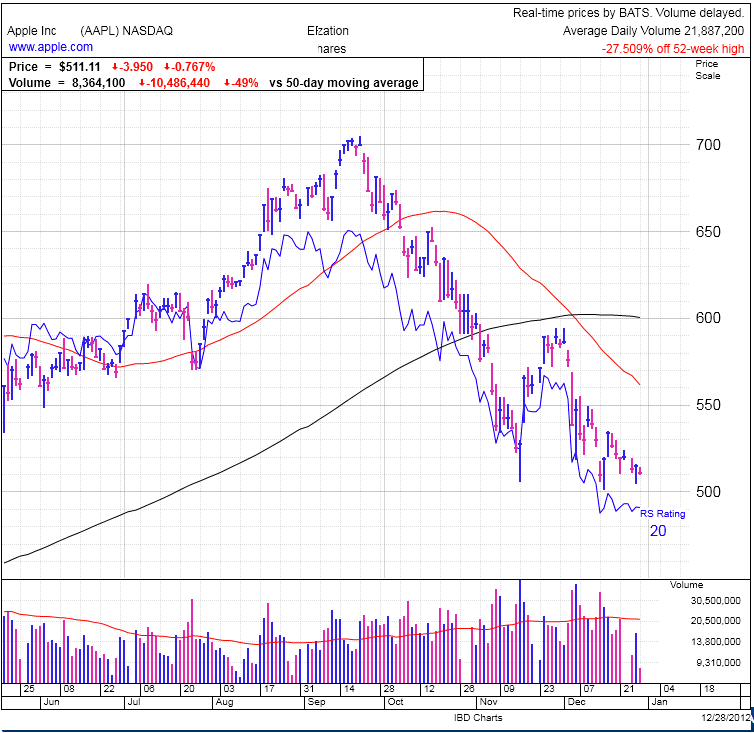 AAPL is holding up fairly well all things considered. It gapped lower at the open, but is still trading above the daily lows as the market is making new lows. This behavior shows most of the weak holders in AAPL have already sold and there is some price stability as the new owners are much more willing to sit through some volatility. Stocks traded flat for the first half of the day, but rallied into the close on above average volume. This was a nice win for the bulls, but all seems for naught as overnight futures are down sharply after conservative House Republicans rebuffed Boehner and his Plan B. These dysfunctional developments make it less likely we’ll reach a workable compromise before yearend. If the drop in overnight futures holds into Friday morning, we could see a wave of emotional and stop-loss selling hit the markets. For many traders this will be a sell first, ask questions later situation. But the big question isn’t how we will open, but what will happen in the second hour of trade. Will value investors jump in and take advantage of the newly discounted shares, or will buyers prefer to wait and see how low this will go before stepping it? No doubt we will see sellers in the morning, but the ball is firmly in the buyers court as to when they chose to prop up this market. If they step back for a couple of days we could see a noteworthy slide in stocks as they fall in the vacuum of absent demand. But here is the thing, the Fiscal Cliff is an event created by our politicians and it will be solved by our politicians. This is not a sub-prime lending scheme that is about to collapse the global banking sector. This is simply our politicians kicking a can down the road. Maybe US debt will be downgraded by a ratings agency or two, but paradoxically this will probably lower our federal borrowing costs as traders seek shelter in US Treasuries. Watch early trade to see how buyers and sellers respond Friday morning. The 1.7% dip in overnight futures might even mark the low of this event. After-hours and overnight markets are far less liquid than the primary markets, so a few panicked sellers can have a far more dramatic impact in these markets before cooler heads prevail at 9:30 in the morning. Or not……. Watch early trade for signs of selling accelerating as the floor falls out from under the market, or alternately buyers step in and we rally off the early lows. Fundamentally this is largely a non-event, but the media has done a good job of hyping this up that could lead to a wave of emotional selling. But I love emotional selling because that is how we make money. The same ideas hold for Friday as they have all week. Long-term holders, don’t lose your resolve. You knew this volatility was a real possibility, don’t lose you nerve now. Short-term traders don’t try to catch the falling knife. Wait for a bottom to form before buying discounted shares. Shorting would still not be advised because this market could bounce at any time. If you simply must short the market, don’t hold for more than a couple of days, which would be hard given the upcoming calendar. AAPL will likely get caught up in any selling, but none of this changes the fundamental story. 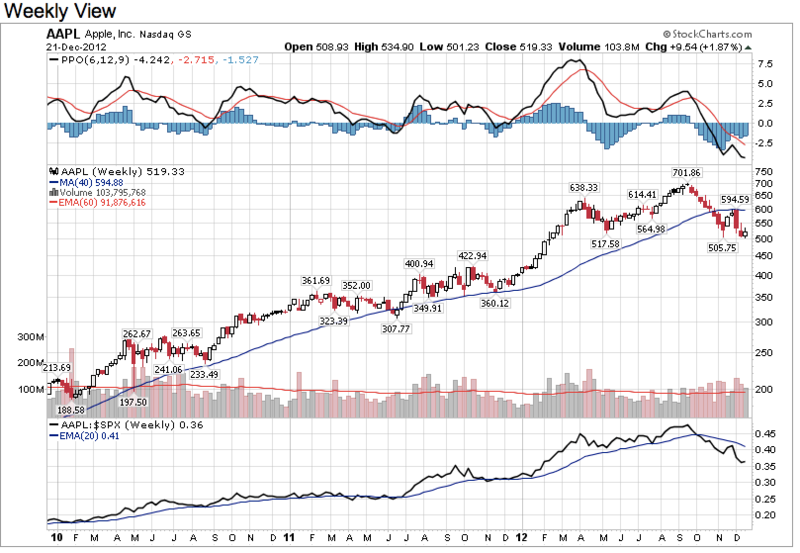 If AAPL was attractive at $525, then it is even more attractive at $495. Trade your conviction and don’t let near-term volatility spook you out of a good trade. We knew this could happen, we accepted the risks when we thought about it rationally, and now we must come face to face with these risks when the market moves against us. But whether it is in AAPL or anywhere else, if you are uncomfortable, sell, regroup, and wait for the next trade. Always live to fight another day. If that means selling at the bottom, so be it. There are old traders, there are bold traders, but there are no old, bold traders. The S&P500 is trading near flat this morning after yesterday’s big selloff. A new wave of sellers failed to show up, but buyers are also taking a wait-and-see. And here we are waiting for something to bump the market one way or the other, giving bandwagon traders something to jump on. We are quickly approaching the holiday and trading volume will fall off with each day closer to Christmas. There are two effects to watch because of this light volume. First, big money managers are on vacation and without their approval, junior traders manning the desks will have limited buying authority. Second is the low volume will make it easier for smaller blocks of trading to move the market. Because of these, expect more volatility with a slightly negative bias. Of course a surprise Fiscal Cliff deal could pop the thin market in a painful way for any shorts. Yesterday’s selloff brought a little life back to bears and made bulls a touch nervous. But all the failed breakdowns recently sound a bit like Chicken Little and many traders are paying less attention to them. You could same some complacency is creeping into the markets and that is never a good thing. Traders seem more hopeful of a Fiscal Cliff deal than fearful of gridlock. And fundamentally they are right about not reaching a Fiscal Cliff deal by the end of the year since most of it can be unwound retroactively. But that discounts the emotional selling from the average retail investor who has been spooked by the 24/7 coverage of the Fiscal Cliff. If we think about the market like a spring, the recent rally unwound the upside potential and it is getting a bit stretched at this point. Further, the downside spring is more coiled that it has been in a while. While my medium-term bias continues to be positive once we get past the Fiscal Cliff debate, supply and demand might dictate some temporary weakness. This is not a sure thing, but just something to keep in mind if you see some down days over the next couple weeks. The Fiscal Cliff could spook the market, but it won’t crash the market. How to trade the coming days, longer-viewed traders should hold positions through the weakness. Swing traders should lighten up and look for better prices to buy in at and shorts should be extremely careful because the market could pop at any moment if our politicians actually do their job and compromise for the sake of the country. AAPL is trading lower, extending yesterday’s slide. This is a volatile name and speculators are driving this thing all over the place. Up, down, up, and down again. Day and swing traders should lock in profits quick on this name because it will reverse on a daily basis. But longer-viewed holders just hold tight. The key to making money in the markets is buying right. And if you bought right, you should be okay with this volatility. If anyone wants to get in on this trade, wait to buy the dips, don’t chase the rallies.